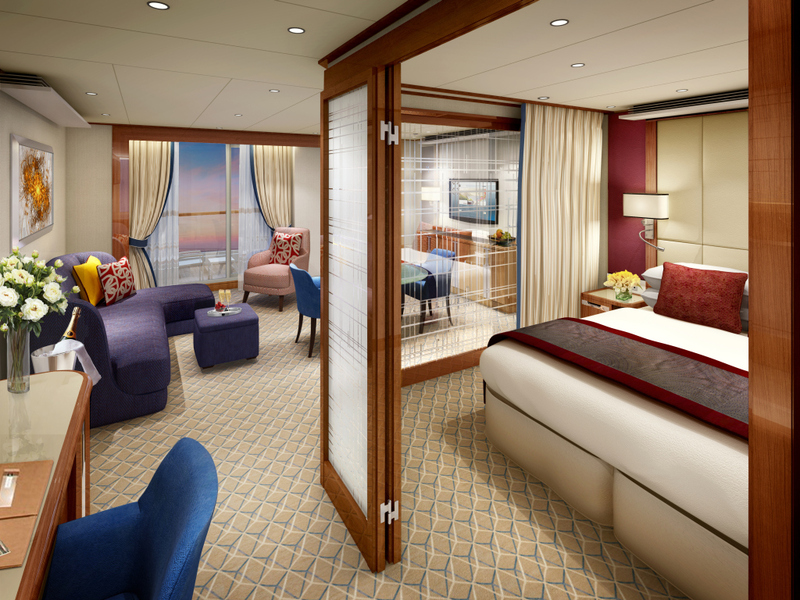 Seabourn has revealed a selection of design renderings for the suites on Seabourn Encore, the line’s newest, ultra-luxury ship set to launch in late 2016. 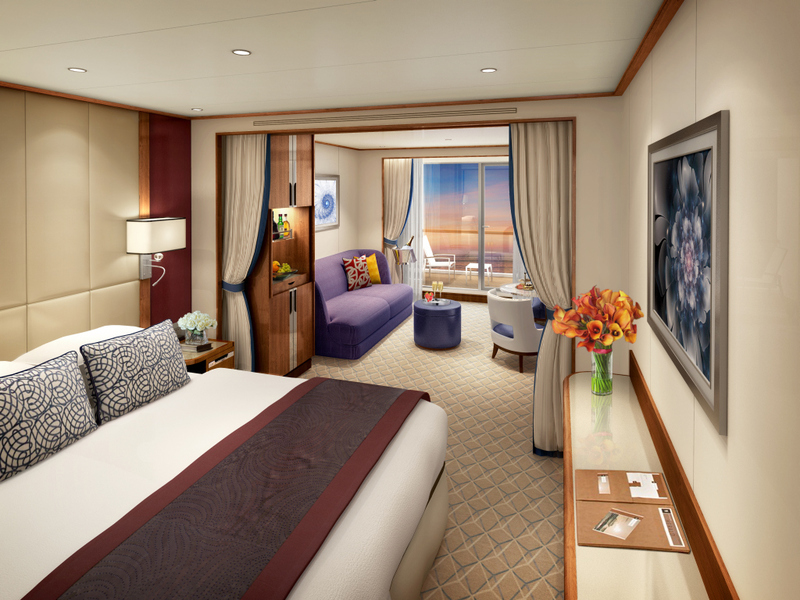 The 600-passenger all-suite Seabourn Encore will feature 300 spacious, well-appointed suites, each of which will come with its own private balcony. 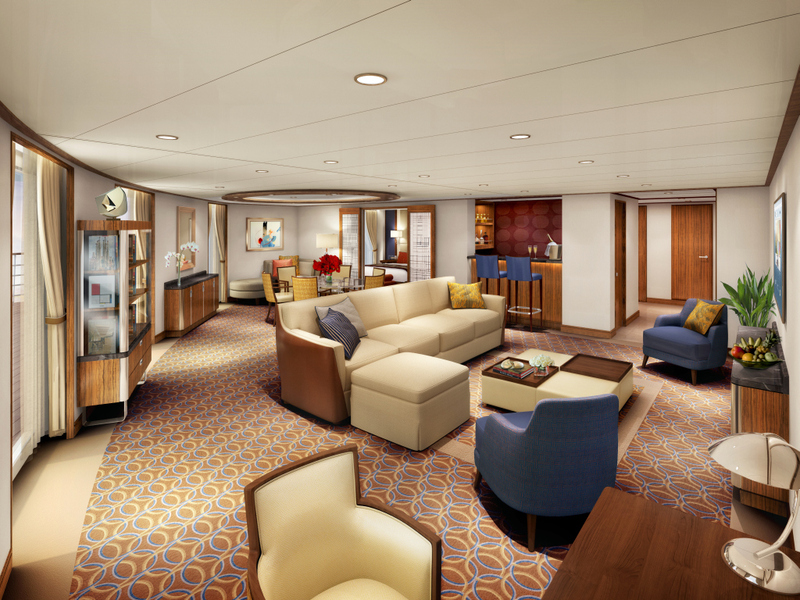 The majority of the ship’s suites will range from just under 300 square feet of internal space in the Standard Veranda Suites to upwards of 1,300 square feet of internal space in the luxurious Wintergarden Suites. The suites on the 40,350 gross ton ship have been designed by hospitality design icon Adam D. Tihany to incorporate modern design elements and innovations. Guests will enjoy spacious suites with a striking design, tasteful and sophisticated décor, together with an abundance of light. Each suite will feature rich mahogany woods, subtle nautical references in the blue and white detailed carpet, and a tailored white stitched upholstered headboard. In the Penthouse Suite, guests will have the option of closing off a patterned glass wall partition in the living room to create a distinctive and private bedroom space. Each suite will include a queen-size or two twin beds; a pleasant, separate living room area for enjoying expansive ocean views or in-suite dining; ample storage and a walk-in wardrobe with a personal safe; a choice of pillows, and a complimentary mini-bar stocked and refilled daily with guests’ preferences and choice of wine and spirits. Entertainment options will include an interactive flat-screen TV system featuring movies, music, shipboard programming featuring lectures and live views from the bridge, as well as a selection of broadcast network television and radio channels. 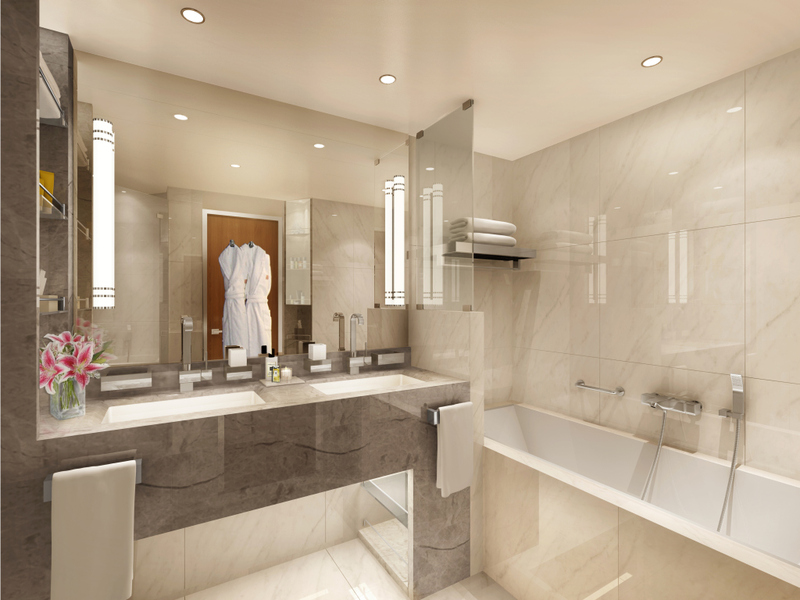 Luxuriously modern bathrooms will be decorated with polished marble and will include a full-sized bath tub, a shower, double sinks, and bespoke bath products from Molton Brown.